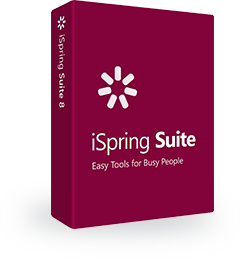 Today, we are introducing iSpring Suite 8.7, the brand new version of iSpring’s e-Learning authoring toolkit. We are most excited to announce the next step in our efforts to help educators build e-Learning content more efficiently: two completely new tools for fast course design and development. These tools introduce new, easier ways to build courses. The first one is to simply convert your existing office documents into e-coursebooks, and the second one is to build courses from ready-made blocks just like a house from lego bricks. Let’s dive in and see what makes the new release of iSpring Suite so useful and capable. 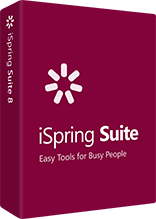 iSpring Suite 8.7 features a broad and compelling set of ready-to-use assets: course templates, characters, backgrounds, graphic objects, icons, buttons, and controls. The course templates are real time-savers. You don’t have to reinvent the wheel every time you build a course: instead, you can use a template as a starting point. Each iSpring template is developed by e-Learning pros and includes all the components which are essential for an efficient and comprehensive course. Plus, the templates’ cohesive design ensures that your entire course has a neat and consistent appearance. And with cutout characters, you can create a lesson presented by a virtual teacher, or simulate a conversation with an irate customer, or use ready-made dialogue templates to train and motivate staff. A basic set of e-Learning assets is already included in your iSpring Suite. You can subscribe to the iSpring Content Library to enjoy the full collection. You can turn ordinary documents, files, lecture summaries and manuals into e-Learning courses in just two clicks. This is what the brand new iSpring Flip tool does. Just select a source – it can be any Word, PDF, or PowerPoint file – and iSpring Flip converts it into an interactive e-book with animated flipping pages. support e-Learning specifications: SCORM, AICC, cmi5, and xAPI (Tin Can). That means you can upload e-books to an LMS, and track readers’ progress literally page by page. Note: Please consider that iSpring Flip is an extra tool available to all iSpring Suite 8.7 customers, and it has to be downloaded and installed separately. We at iSpring have always been positively fanatical about supporting all the tiny tricky options of PowerPoint. iSpring Suite 8.7 handles effects exactly like PowerPoint itself and saves the state of animations and triggers so they don’t roll back to their initial state when a viewer revisits a slide. It allows you to create intricately animated presentations, quizzes and Jeopardy-style games. With the updated iSpring TalkMaster, you can assign points for each reply choice. As learners go through a dialogue, they collect points on each scene, or get penalties on incorrect replies, and the cumulative final score reveals the level of their performance. You can now rate multiple subjects in a single quiz! If you split quiz questions into groups according to their topics or level of complexity, you can score each group separately. This new scoring option makes it easier to identify learners’ strengths and weaknesses. Nice updates with cool features, but for most (new) characters and pictures you have to buy extra yearly subscription. In iSpring you can see all pictures, but most are marked with a lock and need subscription. I would prefer to see only the usable included pics. iSpring Suite is not freeware with premium options. Thank you iSpring for the greatest updates in 8.7!!! The new version comes with iSpring Content Library with huge selections of backgrounds, objects, icons, characters, controls – all these features will help users to develop courses even faster. Unfortunately, the excitement is only temporary and this a big let down to the user because like Stephan said, almost all features are locked and only available once you subscribed to the premium features. While I understand the commercial reasons to do this, I would appreciate if these features are bundled together only in the annual maintenance plan. Stephan, thanks for having shared your feedback. We work on making the Content Library nicer and easier to use, and your opinion is very much appreciated. Can we contact you to know more about your experience with iSpring? Hi Kasard Great, thank you so much for your feedback. I really appreciate your involvement. Let me give you some more details on what’s included in the iSpring Maintenance Plan, Content Library, and how we price everything. It’s very important to us that you get the maximum value for every dollar you invest in our tools, and never pay too much. Indeed, the Maintenance Plan is $397; however, with a new iSpring Suite license, you get a 1-year Maintenance Plan for free. Those who renew their Maintenance Plan prior to its expiration date get a special discount, making the price only $297. – Live technical support. If you’ve had the chance to work with our support engineers, you already know that they’re always ready to quickly answer any question, offer a solution for every complex case, and even schedule a remote session. Actually, 80% of cases are solved within two hours. – Unlimited upgrades. Each iSpring update introduces new tools and major features, not only minor refinements. We’ve just recently come up with the third big release in 12 months. In this update, we’ve added iSpring Flip, the completely new tool for creating e-Learning longreads, enhanced TalkMaster, empowered QuizMaker, and, of course, made a number of minor improvements. Before version 8.7, iSpring Suite was shipped with a small Content Library. In version 8.7, we did two things: updated our basic built-in Content Library and released a completely new product, an extended Content Library. The basic Content Library, shipped with iSpring Suite 8.7, was enhanced with 2 new characters, 55 realistic backgrounds, 60 icons, 43 controls, 1 course template with 28 slide layouts, and 12 images of gadgets and office supplies. This all is available for free to those who have an active Maintenance Plan. – 600 objects (icons, controls, etc.). This new iSpring product is available by subscription, and it will be updated every 4-8 weeks with new characters, templates, and objects. For users with an active Maintenance Plan, an annual subscription for the Content Library is only $297. – If you bought iSpring Suite more than a year ago and have no Maintenance Plan, the Maintenance Plan for you is $397, and the Content Library will be $297 (after you purchase the Maintenance Plan). We believe the price/value ratio is quite fair and we’re always open to negotiate every particular case. We’ve received feedback like yours from several customers and it looks like our announcements about the 8.7 release confused some of our clients regarding the new Content Library. It was not clear that the full Content Library is a new subscription-based product, and some users thought it was included with iSpring Suite for free. We’d like to apologize for that. If you don’t mind, I’d like to contact you and offer you a special price for the full Content Library. I appreciate your patience and involvement. Hi Stephan I made exactly the same comment. We are paying for software but then it feels like we only have a second rate option. The pictures we see should only be the ones we have. I have to agree with both Stephan and Kasard. iSpring is great software but I am not happy about the way it is commercialised. Without repeating what they have both said, I just wanted to add that having to pay a premium on the extension fee, just because it ran out three months ago, also seems a bit stiff. As Tonya explained, if you keep up with the maintenance plan, you just pay $297 but if you go over the 12 months, it shoots up to $397. My maintenance ran out in December and I had no idea that I would have to pay an extra $100 to keep it going. I find the whole idea of the maintenance plan difficult to get my head around and not very fair. When you subscribe to the maintenance plan, you have absolutely no idea what (if anything) is going to come round the corner. It seems to be the previous system was much clearer (and fairer). Now, if you don’t pay up every twelve months, you are penalised when you do eventually update or upgrade plus, you are effectively only having guaranteed software for 12 months. If there is a security issue, then if you have had the software for more than 12 months and you haven’t coughed up for the maintenance fee you won’t get the fix. Competitors have a subscription service for everything (software and content). iSpring want us to pay for software and content separately and, that works out to about $600 a year. I would prefer to just have the software without a subscription or a maintenance plan, just as it was before. All that said, I congratulate iSpring for finding and developing innovative applications and new features in their software. Hi David, thank you for taking the time to share your thoughts with us. Let me give you some more details on how we price. We have a flexible model where it’s up to the customer which set of features they’d like to have. iSpring Suite already includes a set of characters and objects, and you have to purchase extra ones only if you use them extensively in your work. If we always shipped the full set of assets with iSpring Suite, it would automatically raise the price of the product. For now, we prefer to keep prices affordable and allow those who need additional assets to buy the full collection separately. Plus, you get a lifetime license of iSpring Suite, not a subscription license, and you can use it for more than one year without paying extra. Sure, when it comes to upgrading to the newest version, an extension payment is required, though it’s still not obligatory. And we do not penalize if a client updates their license a bit later. Instead, we provide bonuses to those who update in advance; it’s a sort of early payment discount.